Our online catalog lists each style, color, size, and width that is made and stocked in inventory. Please understand that any given item can be temporarily out of stock due to supply and manufacturing circumstances. You will be notified immediately if a requested item is not available, and the approximate delivery date for that item will be provided. You may elect to leave the item on back order, or if you prefer, to cancel the order. All items are guaranteed against defects in materials and workmanship. For your convenience, our online shopping cart accepts the following credit cards - American Express, Discover, MasterCard, Visa. Personal check, cashiers check, money order, or credit card can be used if the order is mailed. The international shipping charge is $135.00 per pair of shoes. If the requested items are in stock, the transit time (via UPS) is normally 4-5 days. There is no U.S. tax charged on the purchase, but any tax or duty applied by your local authorities upon arrival would be your responsibility. All destination customs/duty charges are the responsibility of the purchaser. 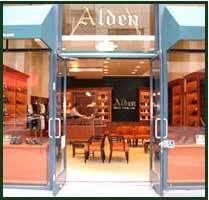 If you have any questions about obtaining the best fit for your Alden shoes, please email or call for assistance. When you receive your order, please try the shoes on a carpeted surface until certain the size/width is correct. You may return any item unworn within 90 days of receipt for exchange of style, size, color, or for refund of the purchase price. All returns must be received in new condition to allow for restocking. A return authorization is not required, but please do include your name, address, phone number, and reason for return. We keep individual size/width records of your purchases, so once your size is established, exchanges are seldom necessary for subsequent orders.